The small Maine town of Freeport is known throughout the world as the headquarters of LL Bean, but there's more to Freeport than just Bean Boots. Settled in 1700 and known then as Harraseeket, Freeport was incorporated in 1789 and re-named for its generally ice-free port. The town's four villages made their living cutting trees for ships' masts. Later, four shipyards were built and shipbuilding and farming thrived. In the late 1800s and early 1900s, sportsmen began passing through Freeport on their way to Maine's dense forests. They'd stop here to buy provisions and hire guides. In 1912, Leon Leonwood Bean began selling his Maine hunting shoe at a shop in Freeport Center. The shoe had a rubber bottom to keep a hunter's foot dry, and a leather upper to let the shoe "breathe" and not retain perspiration moisture. Soon the LL Bean shop, stocked with a variety of backwoods equipment and supplies, became a must-stop for hunters on their way into the Maine woods. The boom at Bean's has brought prosperity to Freeport, a town of barely 8000 residents, and dozens of other stores—Dansk, Anne Klein, Ralph Lauren, Hathaway, you name it—have opened in order to profit from the press of Bean buyers. In effect, Freeport has become Maine's town-size shopping mall. Wolfe's Neck Woods State Park, a favorite local spot for birdwatching (especially ospreys), is just over 5 miles (8 km) south of the center of Freeport. Bradbury Mountain State Park is 6 miles (10 km) northwest of Freeport in the town of Pownal, offering birdwatching, camping, hiking, off-road biking, horseback riding, and winter sports of cross-country skiing, snowshoeing and snowmobiling. The Mast Landing Audubon Sanctuary of the Maine Audubon Society, 140 acres (57 hectares) along the Harraseeket River estuary with three miles (5 km) of nature trails, is a great birdwatching site only 1.3 miles (2 km) east of the center of Freeport—you can walk the distance in 30 minutes or less. Greyhound and Concord Coach have bus service to Freeport, and Amtrak's Downeaster train travels between Boston MA, Portland, Freeport and Brunswick ME daily. 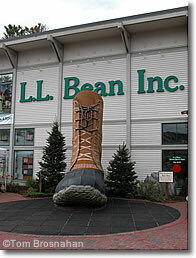 the LL Bean store in Freeport ME.